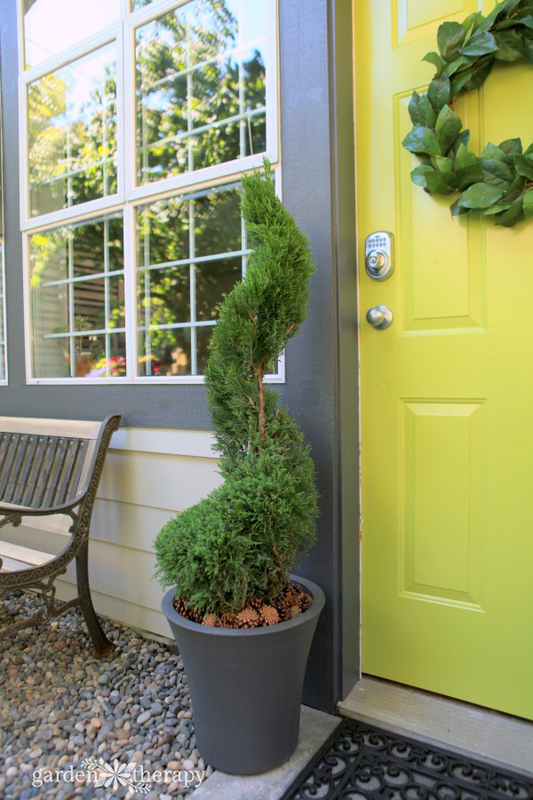 A topiary is an exceptional garden feature that will elevate your yard with artistry. Before the topiary gets to the garden center, there is significant time spent growing, training, and pruning the shape, not to mention the thought that went into creating the perfect design to begin with. Given all that goes into creating topiary, it would be a shame not to care for it properly once you have it planted at home. Come with me on a journey to see how a topiary sprouts from shrub to showstopper, and learn how to maintain this living beauty in the home garden. Disclosure: This post is sponsored by Monrovia who have been growing topiaries longer than I have been alive. I had a behind-the-scenes tour of the Monrovia nursery in Oregon last year and fell in love with the craftsmanship. 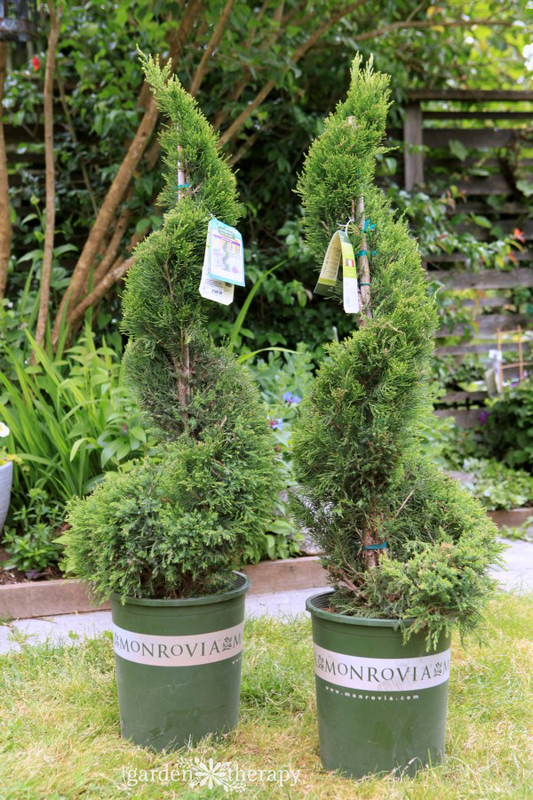 They were kind enough to send me a pair of Juniper ‘Mint Julip’ topiaries to try out in my garden. I also had the opportunity to interview a Monrovia Craftsman, Orlando Bejar, on topiary care so I can share the proper instructions. All opinions in this post are my own. Be sure to check out the shop.monriovia.com giveaway at the end of this post as well! Topiaries are a great investment because of the attention, time, and artistry that goes into getting them ready for the home garden. Throughout their early lives, they will be lovingly tended to at the nursery until they reach their desired size and fullness. Not all topiaries are equal. Monrovia topiaries take at least three to four years of growth before they even get their first shaping (could be longer depending on the variety). Then they will be shaped again several more times over subsequent years before they’re large and lush enough to be sold at a retail nursery. 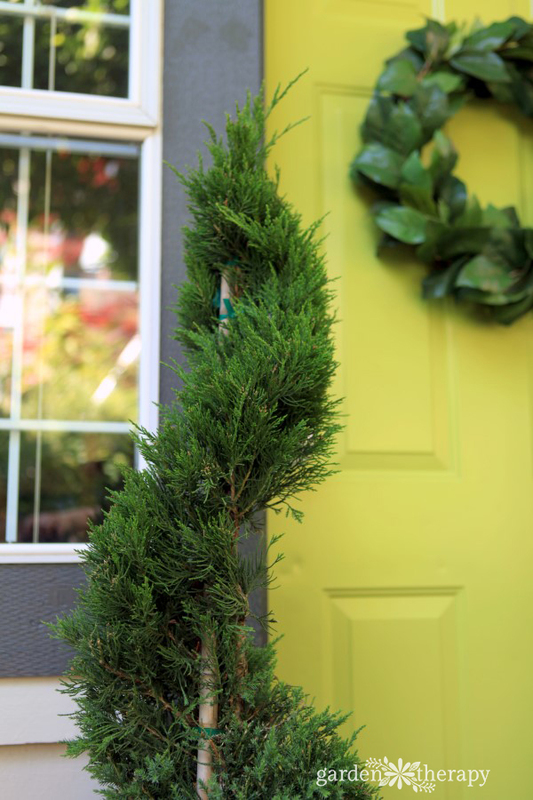 The perfect shrubs for a topiary are small-leafed plants like Juniper (Juniperus), Privet (Ligustrum), Boxwood (Buxus), Myrtle (Myrtus), Holly (Ilex), Rosemary (Rosmarinus), and Brush Cherry (Eugenia). 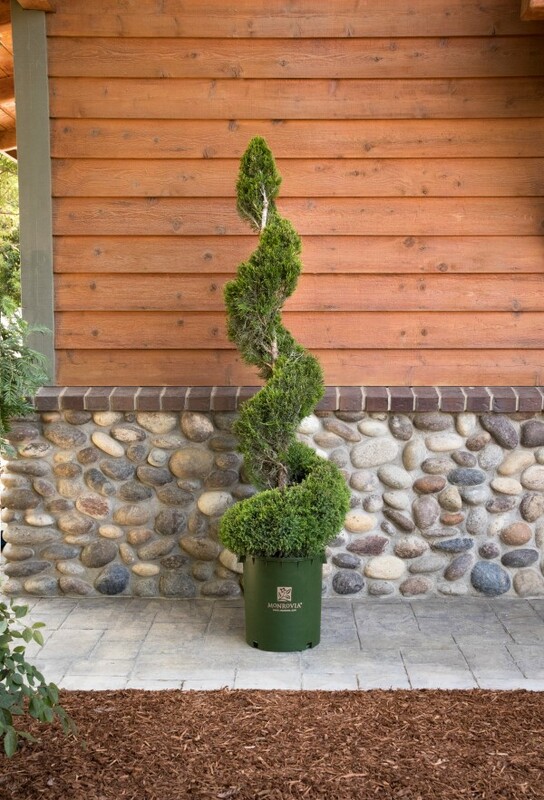 There are various shapes of topiaries such as a cone, pompon, and pyramid, but the most popular are the spiral. Let’s see how it takes shape. This animation shows a ‘Mint Julip’ Juniper going through all of the stages to become a spiral topiary. 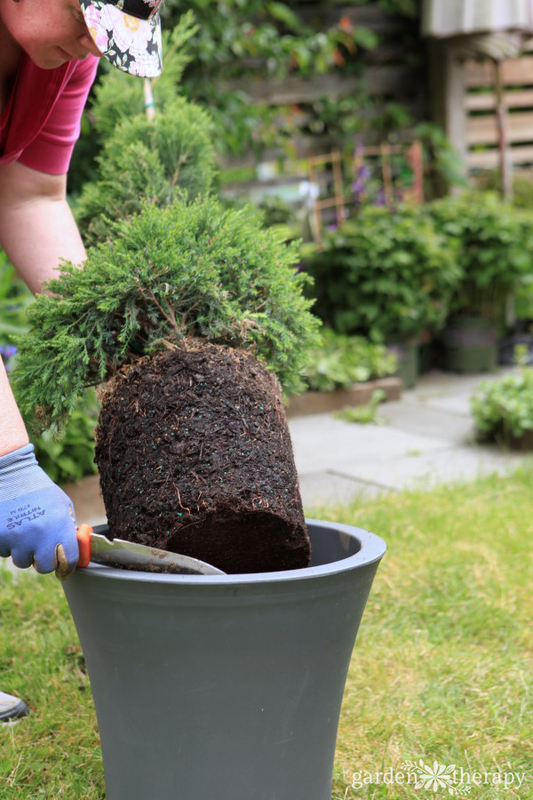 Starting with a small rooted cutting, the upright Juniper is potted and staked when large enough. When it reaches the standard height of 42 inches it then gets four cuts to shape it in that year. The first cut is to shape it into a spiral. This is typically the stage of topiaries that are found in large chain stores. Monrovia will hang onto the topiary for at least another year, giving it three more cuts to stimulate the growth and encourage it to become fuller. Timing the pruning during the growing season is an important factor to getting just the right shape and fullness. The first pruning (shaping) is done in March, the second pruning in May, the third pruning in July, and the fourth pruning in September. The Craftsmen don’t use any special equipment, all of the pruning is done using hedge shears and bypass pruners. Uniformity in the shape, especially when purchasing multiples. Monrovia is known for their uniformity, which is why you can buy multiple spirals that all curl the exact same way and are the right height. No oddballs here! An equally spaced spiral, columns that are straight, and pompons that are perfectly round. Consistent fullness and no bald spots. No signs of disease, pests, brown spots, or discoloration. Caring for topiaries is the perfect way to get your garden therapy. 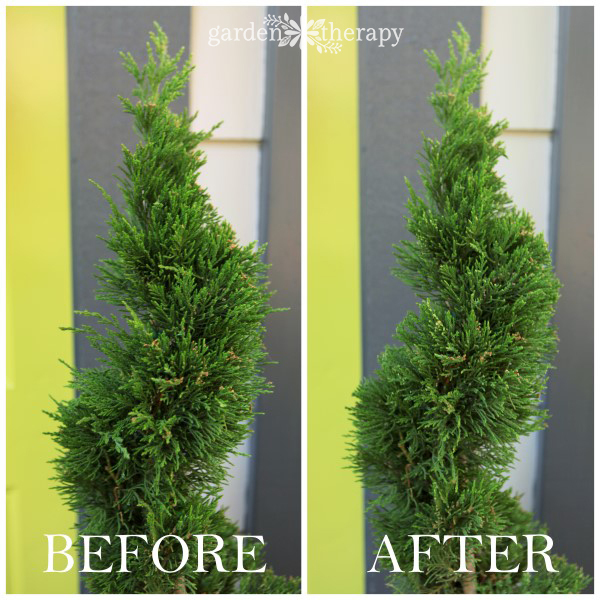 With a few tips and the right pruning schedule, you will be able to keep your topiary looking picture perfect for years to come. 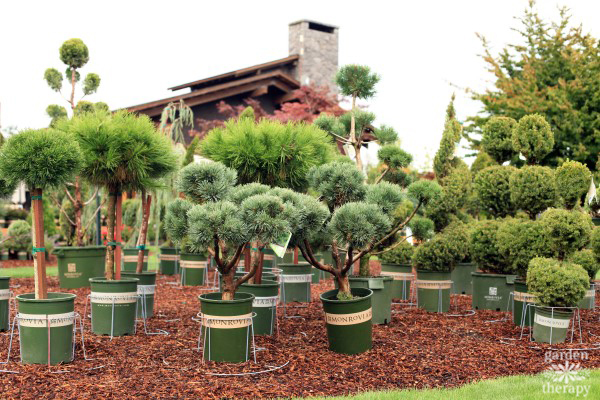 Topiaries are great container plants, but you can also plant them in the ground. Either way, be sure to follow the light requirements on the tag and place them in the right spot. Use a container soil mix for plant pots, and well-amended soil for in-ground planting. 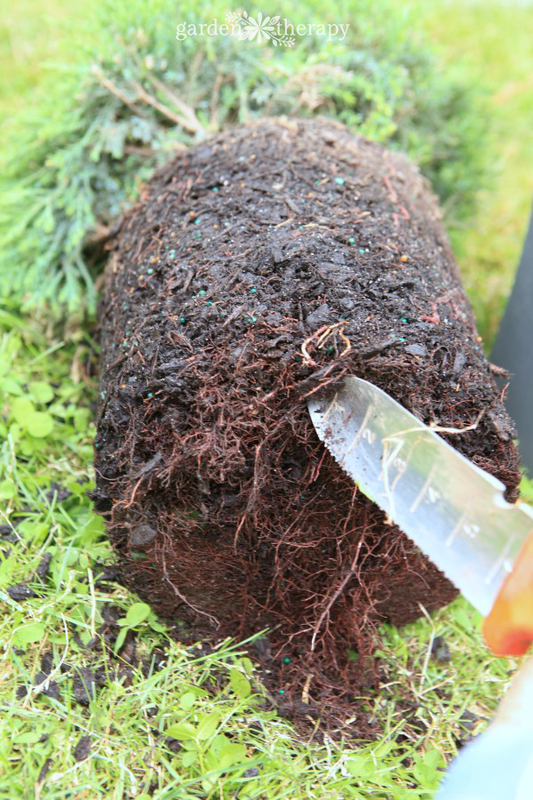 Remove the topiary carefully from the nursery pot and use a soil knife to gently loosen up the roots. When planting in the ground, dig a hole double the width of the root ball when the container is removed. It should be planted at the same depth as it was planted in the nursery pot. When planting in a container, keep in mind that the container needs to be sized up in proportion to the plant as it grows. 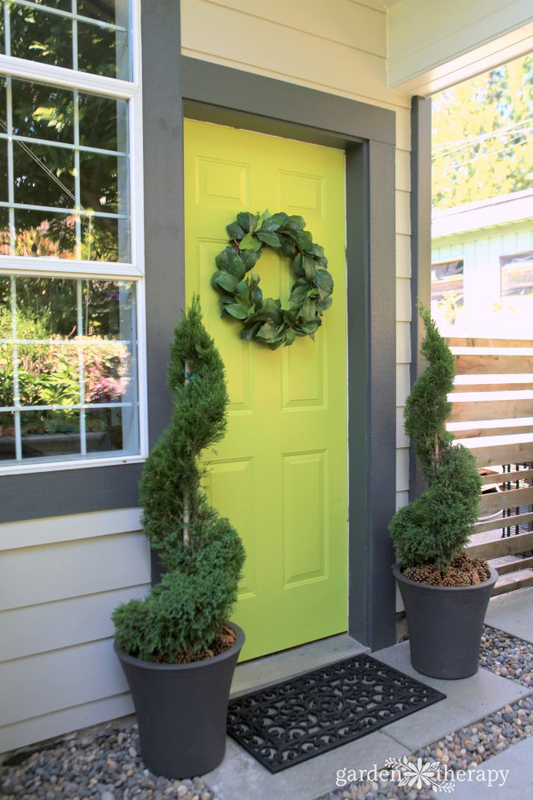 As a general rule, your container should be one-third the size of the plant height. So, if you have a three-foot-tall plant you would need a one-foot-tall container; if you have a six-foot-tall plant you need a two-foot-tall container. The key to keeping a topiary happy is to closely manage the water it gets: don’t let it dry out and don’t overwater it. 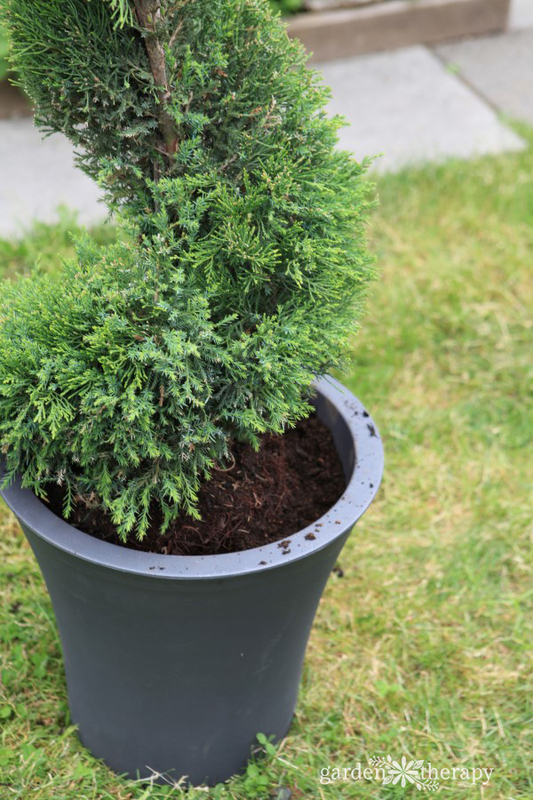 The topiary is already at least five years old so it will have lots of roots to help feed the plant and maintain the moisture, but it also needs good drainage so those roots don’t rot. I make sure to add extra drainage just to be safe. Don’t forget to line the pot with landscape fabric to keep the soil from coming through the drainage holes. 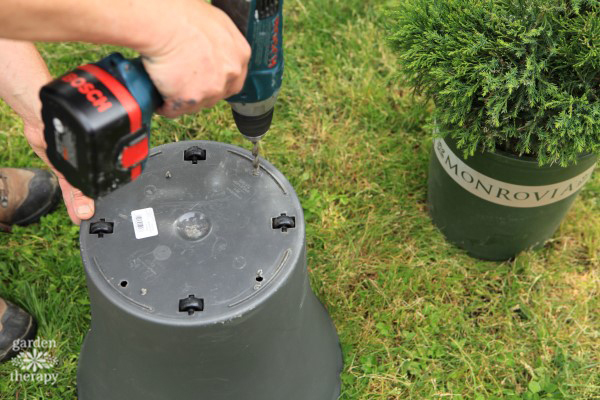 Pruning maintenance of your home topiary is simple as long as you know what you are doing. I LOVE to prune so this is a perfect plant for me. I often get my garden therapy out pruning my espalier apple and thirst for more! Thankfully, I now have two beautiful topiaries of my very own to baby. 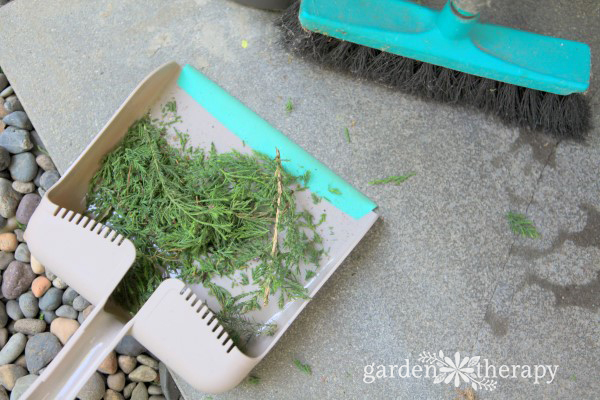 At home, you can keep a pruning schedule similar to what they do at the nursery. Pruning three to four times a year will give you a nice neat topiary that grows and fills out perfectly. 1st Prune: Do your first pruning after the first few inches of growth appear in the spring (in my Pacific Northwest Zone 7 garden, this is in March or April). 2nd Prune: The next prune happens after a few more inches of growth (June or July for me). 3rd Prune (if needed): If there is a lot of summer growth, prune again (August). 4th Prune: Prep for winter with a final prune in the fall (September or October). You don’t need to keep to this exact schedule; it really depends on how well manicured you want to keep your topiary. If you wanted to grow it a little bushier and wild, then you can reduce the number of prunings throughout the year. 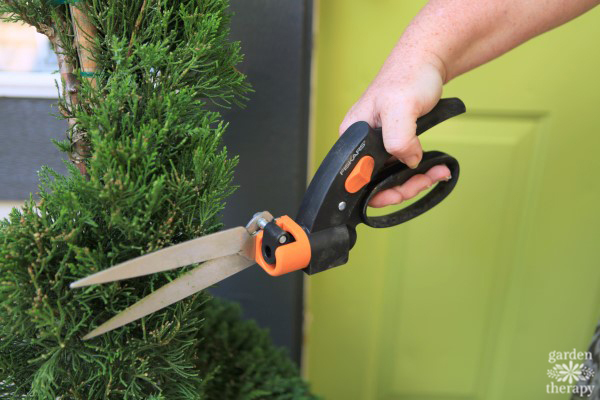 If you want the topiary to be really tightly formed then you can prune it anytime there is growth of at least one inch. I use my grass shears as they made quick work of cleaning up the topiaries. You can see the difference in the before and after photos. It may not seem like I cut a lot off, but just a small trim makes a big difference in the neatness and overall shape. Pruning cuts should be made just above the last prune so that you still have new growth just above that last cut. Taking it back too far is not good for the plant and won’t stimulate continued growth. To keep the shape intact as you prune, follow the lines and maintain the proportions. If you’re never pruning more than just above the last prune, then you should easily maintain the shape as your topiary grows and thrives. 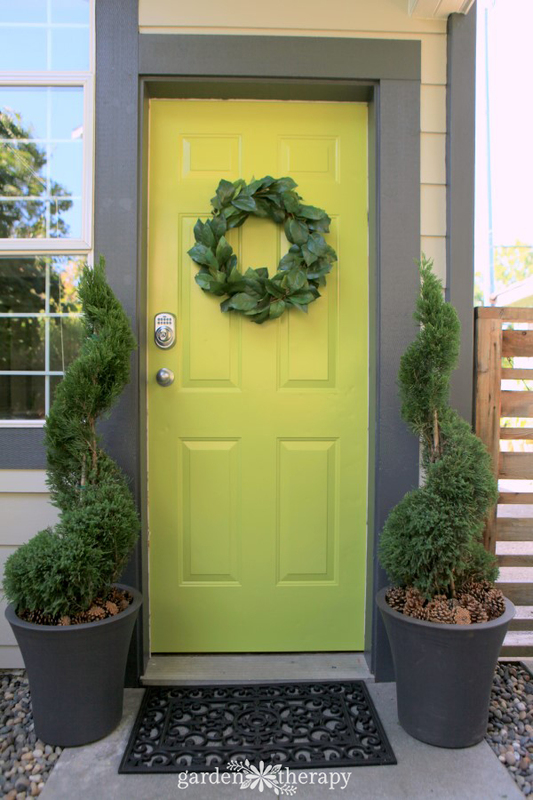 With these tips, you will have a gorgeous topiary to enjoy for many years to come. I’m thrilled to be giving away two $50 gift cards to shop.monrovia.com so you can pick out just the right plant for your garden! This contest is now closed. Congratulations to Shirley and Melissa who each won a gift card! Informative article! I would like to have some blueberry bushes. You are missing something and that is flamingos and dwarfs..